In the picture there is a post shown behind your caravan - is this a pitch marker boundary? If so, then no part of your caravan or accessories should go beyond that point, neither should any part of your neighbour's setup, ie the guy ropes. I suggest you trot down to the site reception to first confirm that you have parked correctly, and then raise your concerns about your neighbour. Don't confront the neighbour yourself, and much as you may want to, don't resort to any underhand sabotage. When we had our first caravan, we had a similar "situation" with a family who attempted to hide their tents by pitching them so close to us that their guy ropes were barely accessible, with one actually tied to our corner steady. There's a lot more to this tale but suffice to say that I complained to the site owner and they were evicted from the site by the site owner. I have to say that this was a one off occurrence and while we have occasionally had inconsiderate neighbours, never anything so blatant as this since. Trust me, the kitchen sink water can emerge through the shower tray outlet so best to avoid linking those two drain pipes, simply because the shower outlet is so close to the height of the grey water container. That said, I have also removed the corrugated waste pipe on many caravans, and replaced it with domestic plastic rigid waste pipes, and included a standard "U bend" under the kitchen sink to minimise the pongs. I have still retained a dedicated outlet for the shower though. It's always advisable to carry an assortment of spares, tools, repair kit and consumables (such as fuses). It's fine to link together the waste water from the kitchen and a hand basin, but it is advisable to keep the shower tray drain separate as sink water can back-feed into the shower tray. Been there (thinking I was being clever) done that, and learned my lesson. Similarly when axles are used in a twin configuration. You would think that two 750kg rated axles would give a load limit of 1500kgs when in fact it could be reduced to a total of 1300kgs, because the load cannot be guaranteed to be shared equally between the axles. The thinner 1.6mm cable is capable of carrying 16 Amps BUT only if air spaced and NOT if coiled up. However the 2.5mm cable is still the better option, not only to minimise volt drop but also for its mechanical resistance to damage and reduced likelihood of becoming tangled. I always use 2.5mm cables when on site but I also have a very short 1.6mm dia dedicated for use at home where the EHU is just 2 metres behind the RV, and I know it will only be used to operate the battery charger. We have two kettles, one is gas with a whistle that can be used anytime, while the other is a low wattage mains electric (750W) one that takes an age to boil but is probably used most as we are usually on EHU, and using it leave a gas ring available for other things. Call me biased but below is a list of the vehicles owned over the years:- Cars Triumph Herald 1200 Wolsley 1300 Auto Triumph Toledo 1300 Renault 6TL 1108 Mini Clubman Estate 1275 Austin Maestro 1750 Renault Twingo 1200 Kia Picanto S 1 litre Volvo C70 Auto 2 litre Kia Picanto Spice 1 litre MGF 1.8 115 BHP Kia C'eed 3 1.6 - totally unreliable so rejected after two months MGTF 1.8 135 BHP Aixam Superlux Auto 500 Towcars Austin Maxi 1750 HL Vauxhall Astra Hatchback 1600s Vauxhall Astra Estate 1600 Volvo 240 DL Estate 2.3 litre Volvo 740 Wentworth Estate 2 litre turbo Volvo 940 Estate Auto 3 litre Jeep Grand Cherokee Limited Auto 4 litre LPG Jeep Grand Cherokee 4.7 litre Auto LPG Landrover Discovery 3 - disposed of it after three months Kia Sorento 3.5 litre Auto LPG Volvo V70 3 litre Auto LPG RVs Four Winds Hurricane 31D Auto LPG Four Winds Hurricane 31D Auto (later model) We've also borrowed my in law's VW campers 2 litre With the exception of the Landrover Discovery all of the above had petrol engines, some with an LPG conversion and I currently still own those in bold. Those in the "towcars" list were fine for towing appropriate weight caravans, except for the Discovery which I felt was under powered for towing. A rear camera is pretty useful when when reversing with a trailer that is narrower than the RV. Otherwise, I agree the large side mirrors alone are fine. The first image shows the kind of vehicles I have towed behind our RV, and the second shows a motorcycle rack that fits directly to the towbar receiver but does not have wheels. It is, in effect, a shelf with an extendable load ramp for the motorcycle. Similar arrangements can be found on European motorhomes but weight is the major consideration. These are the kind of bike racks I've fitted to our previous caravans but no way would I consider them appropriate for a motorcycle. I'll let others chip in with their ideas about your other alternatives but as an RV owner I'll fill in a few thoughts about them for you, understanding that size would not be an issue regarding your driving licence. As you say, they are completely self contained. There will be a cab heater run from the engine but the space heating for the rest of the coach is normally gas powered from an onboard LPG tank and will usually consist of a blow air system with the fan running from the onboard 12V leisure batteries. Mos have either one or two roof mounted air con units that run from 120VAC, either from an EHU or the installed generator. A 16A EHU will normally only run one A/C unit, so you would need to run the genny if you have two units (we have one unit and it is fine for cooling the whole coach via air ducts in the ceiling). I don'y know the rules regarding registration in France, so I cannot say whether a PO Box address is acceptable, equally I cannot confirm that an MOT would not be required every year. As far as road tax is concerned, our RV is £165 a year in the UK which compares favourable with our old 4x4 that was around £450 a year. Our RV insurance is just over £500 a year all in, to include a number of named contents such as laptop, bikes etc. Driving and reversing is a doddle but you'd know that if you're used to trucks, and most have a rear view camera that looks at he ground immediately behind the vehicle's blind spot. Some later models also have side cameras to cover the blind spots below the driver's field of view through the side windows. A motorbike could either be trailed on a trailer, or mounted on a platform fitted directly to the 2" towing receiver. Be aware of each country's rules if you are thinking of having a rigid but supported rack, as you'll probably find that the wheels need would to be braked, and many from the USA are not. As an aside I've towed various caravans with pedal cycles on a rear rack, and they have always been stable but 300kg is probably too much for a touring caravan or European motorhome, both because of the strength of the rear wall, and the payload allowance. Diesel would be costly for a vehicle doing around 8 to 10 mpg, therefore a petrol alternative is probably more viable, especially if converted to run on LPG. Be aware that conversion a few years back cost around £5000 in the UK for a 7 litre V10 Ford engine (so try to find one that someone else has already paid out for this. We had our last one converted but haven't bothered with our current one as we do not do the mileage to justify it. Yep! They're expensive to buy so I won't add any more to that thought. 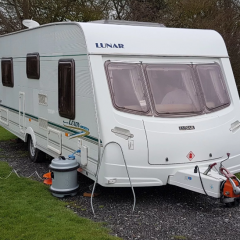 Where to park up may be an issue as not many caravan sites cater for this size of unit, and while an Aire may be acceptable for an occasional overnight stop, I don't think I would want to leave an outfit unattended in one. Similarly quiet side roads are for vehicle movement not camping, so you stand a good chance of being moved on. We have always used formal campsites and not had problems with that providing you book ahead - a phone call is usually sufficient as you can then explain in detail exactly what the vehicle is, and while the wheelbase needs to be on hard standing, the back end can overhang rough ground, even shrubbery if needed. All the best, Gordon.